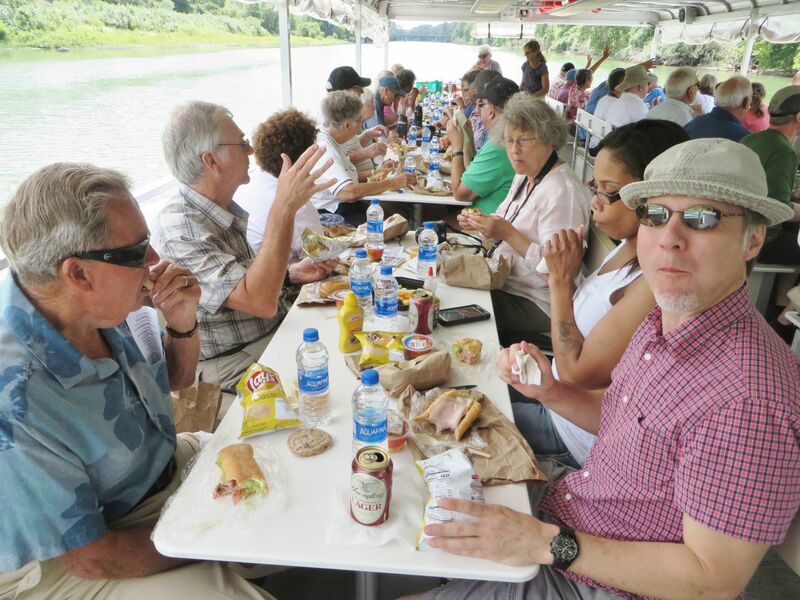 The Lyons dock on the Erie Canal was alive with activity Aug. 10 to 12, as the Lyons Rotary Club and the Lyons Erie Canalway Greeters sponsored four two-hour cruises and one six-hour cruise as part of Fun on the Erie, their local celebration and promotion of the Erie Canal. All cruises were aboard the 48-passenger Reel Tours cruise boat provided by Stivers Seneca Marine in Waterloo. Dockside activities took place before each cruise. Erie Canal Lock 27 T-shirts, sketched by local artist Judy Palermo Shumway, were available at dockside during the entire weekend. Two-hour cruises departed the Lyons dock and traveled west through Lock 27 and Lock 28A near the Drydock. They then returned through Lock 28A and Lock 27 and traveled east to Creager’s Bridge, where the Clyde River and the Erie Barge Canal go their separate ways. The Friday afternoon two-hour cruise, offered at a reduced rate, was sold out. It was a special cruise for senior citizens and veterans. The cruise was subsidized by an anonymous donor.